The Krugerrand was first minted in 1967 by South Africa in order to promote and increase their gold market. This South African gold coin weights exactly one troy ounce and has a purity of 91.67% gold which is the equivalent of 22 carats. The alloyed metal used in manufacturing this gold coin is copper. Its diameter is of 32.7 mm and a 2.83 mm thickness. Many consider that the Krugerrand was the first international gold bullion, being imported by major countries, which is also determined other countries like Canada, the United States, and the United Kingdom to mint their own new editions of gold coins. And so there appeared the Gold Maple Leaf, the Gold Eagle, and the Britannia. This South African gold coin was so successful and wanted that in 1980 its share on the gold coin market was of 90% more or less. However, the success did not last too much in the past mainly because South Africa had a political system with which many Western countries disagreed, the apartheid. The consequence is that these countries declared that importing Krugerrand gold coins is an illegal action. These restrictions disappeared in 1994 together with the removal of apartheid. Disregarding its popularity and the fact that investors appreciate this one troy ounce of highly qualitative gold, the Krugerrand is not considered a beautiful coin. This status of being a beautiful gold coin is more appropriate for the Gold Panda, the Gold Eagle, and the Canadian Coins. 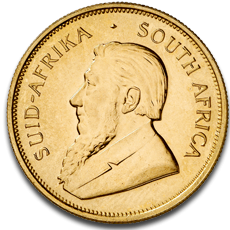 The obverse of the Krugerrand depicts the portrait of Paul Kruger or Uncle Paul as it was known in South Africa. His portrait is facing left and is accompanied by the inscriptions SUID AFRIKA SOUTH AFRICA. The reverse depicts a small springbok antelope in the field and the issuing year. At the top of the coin appears the inscription KRUGERRAND and at the bottom the size of the coin. The Krugerrand is very popular among investors because its price is formed by adding just the affordable premium of 5% over the gold spot price. At first it was not intended as a legal tender, just a bullion coin that had the role to boost the African gold market, but then it gained the status of legal tender which made it to be imported free of VAT. Therefore, if you want cash for gold by selling the South African Krugerrand, you will immediately receive an offer because any investor wants to own a coin of this kind. Compared to investors, the interest manifested by collectors for this coin was not enchanting so the South Africa government decided to mint the proof Krugerrand which has the face value bigger than the bullion one, a not surprising thing at all. The main difference between the two varieties of the South African coins is the serrations belonging to the edge of the gold coin. The bullion variety has 160. The variant designed especially for collectors has 220 serrations. And of course there is the difference of the name, one of the coins containing the word proof. The investors prefer widely the Krugerrand as a bullion gold coin and they can rest assured regarding the matter of counterfeiting because the South African coin is protected by the Part II of the Forgery and Counterfeiting Act 1981.